Oldeania Stapleton, PhytoKeys 25: 100. 2013. Plants self-supporting. 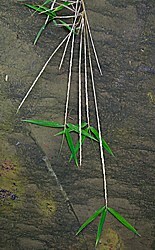 Rhizomes pachymorph, long-necked. Culms to 15(-20) m, to 6(–10) cm in diam., solitary, erect to nodding; nodes lightly raised, supra-nodal ridge conspicuously raised, persistent pubescent culm sheath base very evident, basal nodes and some mid-culm nodes especially on small culms with a prominent ring of short aerial roots; internodes terete or with light to distinct sulcation above branches especially on smaller culms, smooth, not grooved, to 60 cm long, initially pale green with very thin uniform deciduous glaucous wax, becoming glossy yellow-green with orange spots to orange. Branches initially 2-7, reflexed, developing very promptly but sometimes arrested when short and protected by tough sheaths, central dominant, others progressively smaller, lateral branches not all subtended by a sheath; buds triangular, open, budscales tall, 1-keeled, keels ciliate. Culm sheaths papery to leathery, apically triangular, deciduous, initially pale green, with dark to mid-brown, appressed hairs, basally and marginally denser; ligule truncate, long-fimbriate, blade reflexed, deciduous; auricles small or indistinct; oral setae several, spreading, from thick bases. Leaf sheaths glabrous, very persistent, continuous apical growth producing long sprays of up to 50 persistent sheaths, adaxial margin glabrous, abaxial margin shortly ciliate; ligule truncate; auricles small, indistinct to semi-circular, reflexed; oral setae several, white, to 1 cm long, erect or spreading; blade thin, linear-lanceolate, apex shortly acuminate, 8-12(-15) cm in length, venation distinctly tessellate, petiole waxy. Synflorescence semelauctant, paniculate, branch sheathing reduced to hard bracts, soft sheath remnants or hairs. Prophyll and glumes not subtending buds. Spikelets pedicellate with several fertile florets, pedicel scabrous. Glumes 2, bud remnants present or absent, fertile glumes 4–8. Palea 2-keeled, usually equal in length to lemma. Lodicules 3. Stamens 3; filaments free. Lodicules 3. Stigmas 2. Name from Oldeani (Tanzania, both plant and place). Oldeania is a very small genus probably with only one species, native to C and E Africa, readily distinguished from other temperate genera by the solitary culms from pachymorph rhizomes, and by the long pendulous branchlets with very numerous persistent leaf sheaths, in combination with prominent nodes. Although morphologically somewhat similar to Asian Yushania species, DNA analysis has shown that it is not closely related. 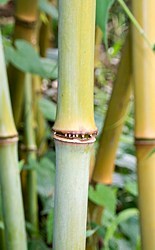 Used in Africa for making fences, furniture, and woven panelling, but not as extensively used as bamboos in Asia, yet. Provides shelter and food to several African primates, notably the Mountain Gorilla. Rare in cultivation but the upright culms with light foliage make it a very attractive species, worthy of more extensive use, but it is not very frost-hardy and requires high rainfall. 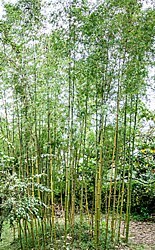 Variation within the one well-known species has not been studied, but it seems remarkably uniform across its range, which is not entirely unexpected as it has has no other bamboo species for hybridisation or introgression. Three poorly known species described from Madagascar are quite likely to represent the same species as that found on the mainland, either native or introduced.